This weeks book is one of the cook books that I have no idea where it came from. It was either one of the many cook books my mum decided not to take with her, or another op shop gift from dad. Either way, it's been sitting around forgotten about until I dug it out for the challenge. It's written by Alison Holst and is called "The Best of Home Cooking". It's very old school, and I find a lot of the directions to be either irrelevant or too vague to follow. But it contains a wealth of great ideas and tempting flavour combinations, so even when I can't follow the recipe, I can usually take the idea away and fill in the blanks myself. This weeks recipe is "Mushroom Mounds". 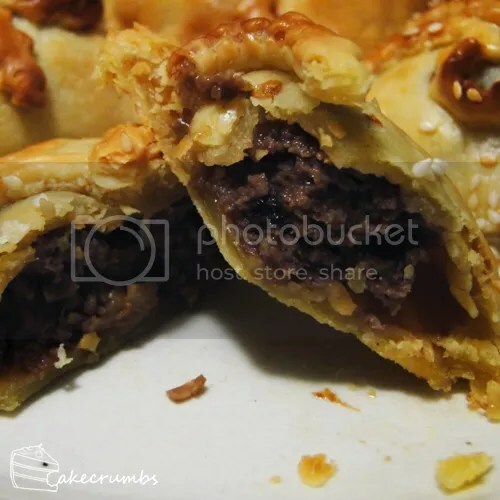 Mounds of mushroom and beef mixture, baked inside a pocket of shortcrust pastry. The recipe is for 9, but as you can see I got a few more out of it. It's such a simple dish you could easily double it and serve it as party food. We had them after an entrée of soup, followed by a peach pie, so we were stuffed. The little ribbons atop the pies are as simple as they are effective. You can make them all identical, or if you're as indecisive as me, make them all different! I was careful not to mention to my sister before serving these that they had mushroom inside, given that she hates them (along with almost every other form of fruit, vegetable and fungus). Thankfully, it was immediately after she'd proclaimed how delicious they were my boyfriend, who loves to re-confirm every single ingredient in the dish as he's eating said, "These have mushrooms in it, yeah?" Sauté mushrooms in butter with lemon juice, the combine with other filling ingredients, reserving half the egg. 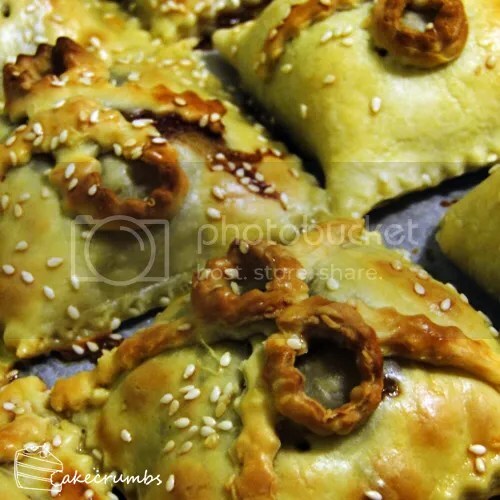 Form into 9 balls; arrange on pastry in rows of three. 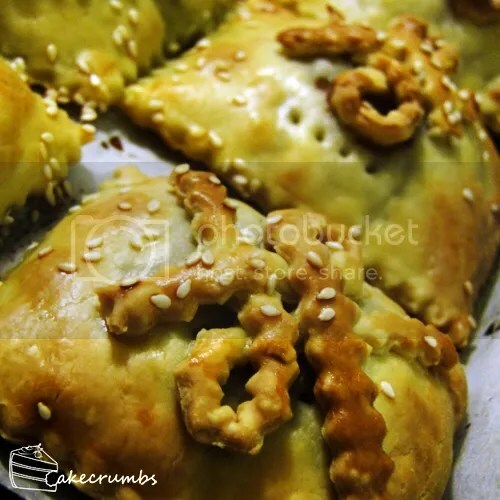 Brush between balls with milk; cover with other square of pastry. Press between mounds with a rolling pin or simply use your fingers; cut air vents on the top. Press pastry around outer edges of the mounds; cut with a knife or serrated cutting wheel. 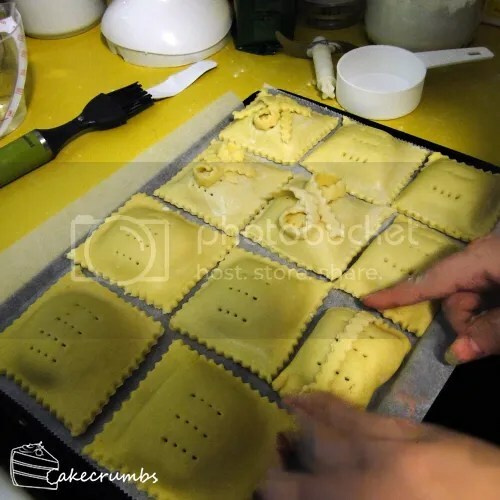 Reroll and cut pastry scraps into strips; arrange on mounds. Brush with remaining egg; sprinkle with toasted sesame seeds. Bake for 30 minutes, or until golden brown. Now your reaction at the time, makes more sense. =P Did Sarah say anything after I asked about the mushrooms?